If you are looking to staff or are seeking employment in the field of Information Technology, Finance, Accounting or Human Resources, look no further. 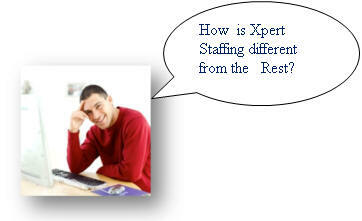 The staffing specialists at Xpert Staffing are dedicated to providing you with the quality of service that you deserve. 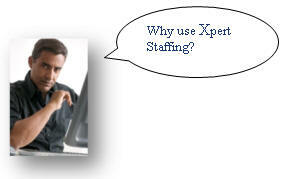 Xpert Staffing is a placement firm that specializes in placing the finest professionals in both permanent and contractual positions within top-notch companies located throughout North Carolina and nationally. We provide exceptional service to our clients that range from small companies to Fortune 100. Our hiring services cover a broad spectrum of industries and disciplines. We pride ourselves on the ethics and professionalism that we have demonstrated throughout our growth. Know what we are talking about. With extensive hands-on experience in each of our specialized areas, our staffing experts know how to speak your language. Listen to your requirements. We take the time to learn about your business, company culture, and candidate expectations. Screen candidates carefully. We aggressively seek those candidates who meet your requirements. Then we go far beyond a candidate’s resume to gain an in-depth knowledge of each person’s skills and capabilities. Our aim is to provide only qualified candidates and not waste your time with candidates who do not meet your expectations. Exercise the highest standards of ethics and professionalism. We follow strict guidelines that serve to protect our clients and candidates. Your time is very valuable, and you should demand nothing short of sincere, knowledgeable, and dedicated expertise when it comes to selecting an agent to service your employment needs. In today’s stressful and highly technical world, it is more important than ever to make the “right” decisions. Although you are ultimately responsible for that final decision, there is a labor-intensive task of finding the “right person for the right job” to ensure a long lasting partnership that promotes your company’s success while enriching your employee talents and loyalty.